The Phelps Brothers grew up in the Southern part of Virginia in the early 1900's. As teenagers their mother would take them around the neighborhood to sing and play their music. Norman, the oldest, played bass and guitar and sang bass. Willie, two years younger, played guitar, drums and washboard and sang baritone. Earl, the youngest, played fiddle and mandolin and sang tenor. They had a beautiful blood harmony. Their down-home-fun-loving style made them local favorites and soon they performed at clubs and on local radio shows. In 1936, the brothers headed to New York to try their luck. They became prize-winners on "Fred Allen's Town Hall Tonight" radio show, landed a Decca Recording deal and performed on the WHN Barn Dance. They met Tex Ritter, Gene Autry and Ray Whitley who also performed on the Barn Dance. 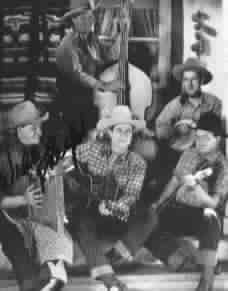 They teamed up with Whitley and a trick banjo player named Ken Card and appeared at Madison Square Garden in the Colonel Johnson Wild West Rodeo Show and started calling themselves "Ray Whitley and the Six-Bar Cowboys". After a stint at Colonel Johnson's ranch in Texas to learn to become "cowboys", they headed west to the 1936 Texas Centennial where they performed and sang "Home on the Range" for President Franklin D. Roosevelt. Their next stop was Hollywood. Whitley had worked as a singing cowboy and soon they were making musical shorts and feature films for Paramount and RKO. They appeared in films with such stars as Tex Ritter, George O'Brien, Smith Ballew, Jack Randall, Loraine Day, Chill Wills, Ward Bond, Martha Ray, and baseball great Lou Gehrig. They met Tom Mix, Buck Jones and the "Sons of the Pioneers". They also appeared on the Hollywood Barn Dance and toured up and down the west coast. In 1940, the brothes became homesick and decided to return to Virginia. They took up where they had left off. After World War II, they bought some property on the Elizabeth River that included a dance hall, and old hotel that they coverted into a recording studio and a barn that they turned into horse stable. This was their home for the next twenty years. They still continued to play in surrounding clubs and appeared on local radio six days a week. They even had a weekly television show. They were known as "Norman Phelps and the Virginia Rounders". The Phelps Brothers were prolific song writers as well as entertainers. Norman wrote "Back in the Saddle" with Ray Whitley but didn't bother to put his name on it. They recorded it in one of their movies. It was later sold to Gene Autry. Willie wrote many songs that he recorded at Fernwood Farms on their label or at Bradley's Barn in Nashville. He also wrote songs that were recorded by Jim Reeves, Ernest Tubb, Ronnie Milsap, Skeeter Davis, and Elvis Presley. Earl Phelps died on April 25, 1971. Norman Phelps passed away on August 24, 1981. They were inducted into the "Western Swing Society Hall of Fame" in Sacramento, CA in 1989 and in Seattle, WA in 1993. Willie Phelps is 88 years old, though he does not admit or look it. He still makes appearances at such events as the annual Phelps Brothers Festival at the Chesapeake Museum in South Norfolk, Virginia in June and the Williamsburg Film Festival in Williamsburg, Virginia in March. He and his band, "Willie Phelps and the Rounders" are semi-retired.